future OA conditions (picture to the right; link to the kelp study) because these algal turfs use the extra CO2 as a resource and grow faster. This conclusion, based on physiological changes, was and still is quite valid. HOWEVER, when we scaled up our experiments to mesocosms (literally “medium” experimental environment or ecosystem) and included the kelp we discovered that the kelp were able to resist a lot of this effect by suppressing the growth of the turfs. 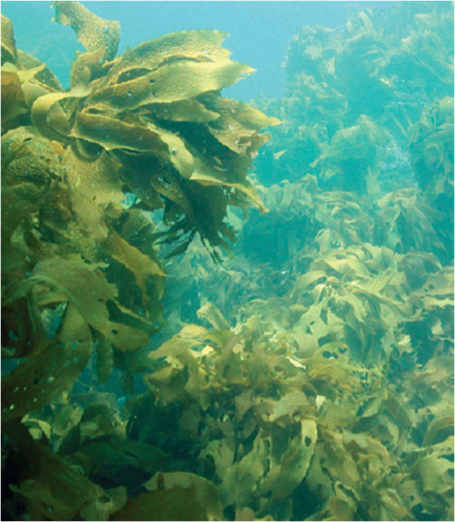 But, realising that this mesocosm study was also limited because it only occurred over one generation of kelp, and you may need to study multiple generations because the adults may not be the “weak point”, we took this work up to the next scale, field experiments at naturally occurring CO2 vents – currently our best “ecosystem” approach to understanding OA. 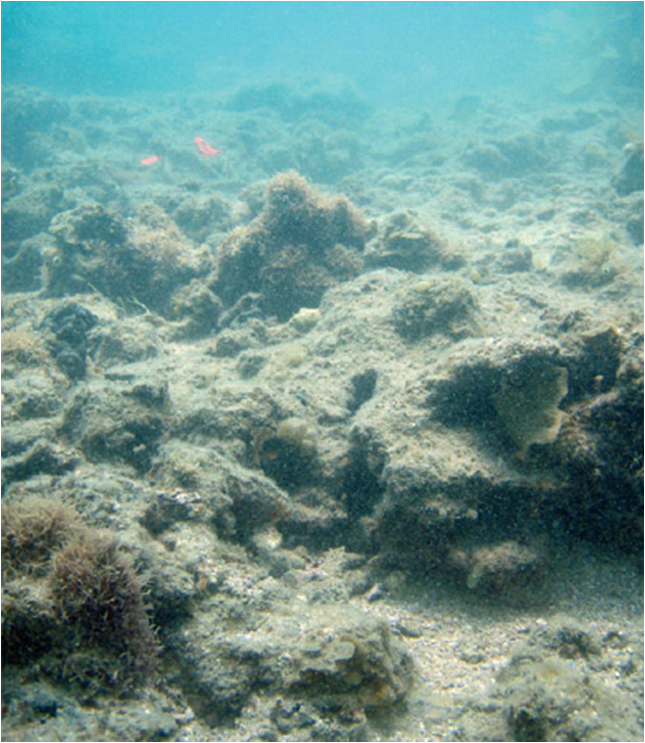 Coral reefs are structurally complex and “cemented” together by Crustose Coralline Algae. relief, we found that algal mats showed the same direction of response to elevated CO2 (i.e. they grew more) across all scales of experiments but that the strength of response was modified by the ecosystem complexity. Basically, the things that either eat or suppress the growth of algal turfs slow the rate at which they will come to dominate the systems. BUT, we did find that these turfs have enhanced productivity and more expansive covers in situ under projected near-future CO2 conditions both in temperate and tropical conditions. ; that is, our original predictions from the laboratory experiments that these weedy turfs could come to replace kelps and corals seems to hold up, it’s just that the rate of change will be a bit slower. Ocean acidification: will there be ecosystem effects? Algal turfs overgrowing corals under acidified conditions at CO2 seeps, which we use at “natural experiments”. 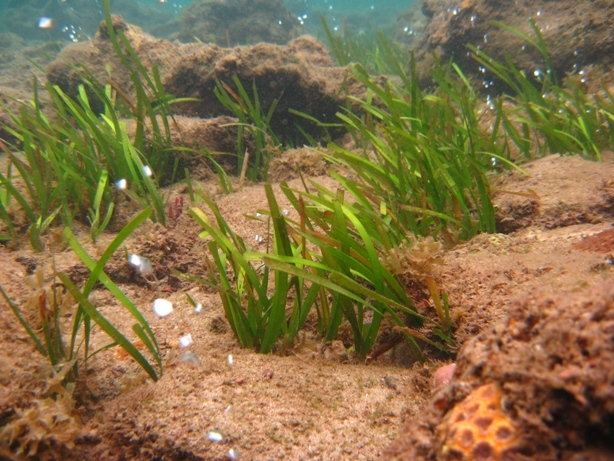 Note that the seagrass in the middle of the photo also grow well under these conditions. It has been a while since my last post, for which I apologise, but I have just emerged from a particularly busy period. I was lucky enough to be invited to an ocean acidification round table at the Peter Wall Institute in Vancouver late last year and we have been madly working on multiple papers since then (and I also had a short break over the Christmas week because of sheer exhaustion!). Why are we working so madly to get the papers written? Because the topic of the meeting is both topical and imminently important: how do we predict the ecosystem-level impacts of ocean acidification, and what can we do about it? Why is this such an important question? The simple answer is that ocean acidification is a direct consequence of increasing CO2 in the atmosphere. It’s simple, indisputable chemistry. As CO2 dissolves into seawater it forms carbonic acid, finally reducing the amount of carbonate in the water (a good diagram of this reaction can be found here). The early research into this field (only 10 years ago now!) focussed entirely on calcifying species, such as gastropods and corals, because they use this carbonate to form their hard structures (calcium carbonate). What we’ve realised more recently, and a big part of my research program, is tha t the extra Carbon in the system (in the form of CO2) is also a resource for some algae and plants, potentially causing a change in the dominant species in ecosystems (see my photo of a “future” coral reef and kelp forest in this post). Algal turfs dominating under acidified conditions at cold-water (temperate) CO2 seeps, which we use at “natural experiments”. You can just see the fronds of a solitary kelp plant in the right of the photo, otherwise they are rare at the site (when they should be 8 – 10 plants per metre!). I’m happy to say that we made real progress in trying to understand what the likely ecosystem effects are globally, and more importantly the things that we need to know into the future. I won’t pre-empt our publications, but the synopsis is that ecosystems will change, and for the worse. This has been highlighted before, including for Australia, but for the first time I think we’re starting to get at understanding the ecological mechanisms (which is essential if we are to help the systems resist this change!). Lead by Prof. Chris Harley, and including an amazing group of contributors, I’d say it was the most successful round-table that I’ve been involved with and we’ll have some good papers coming out soon (I’ll be sure to post about them!). If you’re interested in the topic and want more information, I strongly suggest that you watch this video of the public event we held as part of the week’s activities. The sins of the parents…..
Are not necessarily visited on the children, at least not with ocean acidification. There has been a lot of discussion over the last few years about the ability of plants and animals to adapt to ocean acidification. Some researchers are adamant that the rate of change is so fast that no animals will be able to adapt. A recent study by Miller et al. suggests that this may not be the case. In fact, they show that nature may just be a little more resilient than we give her credit for (or at least some species will be). Professor Phil Munday and his team from James Cook University has been working on this concept for a while. The difficulty is that it is hard to raise multiple species of long-lived animals (or plants) in the lab to conduct these experiments. Miller et al. show that it’s worth trying. 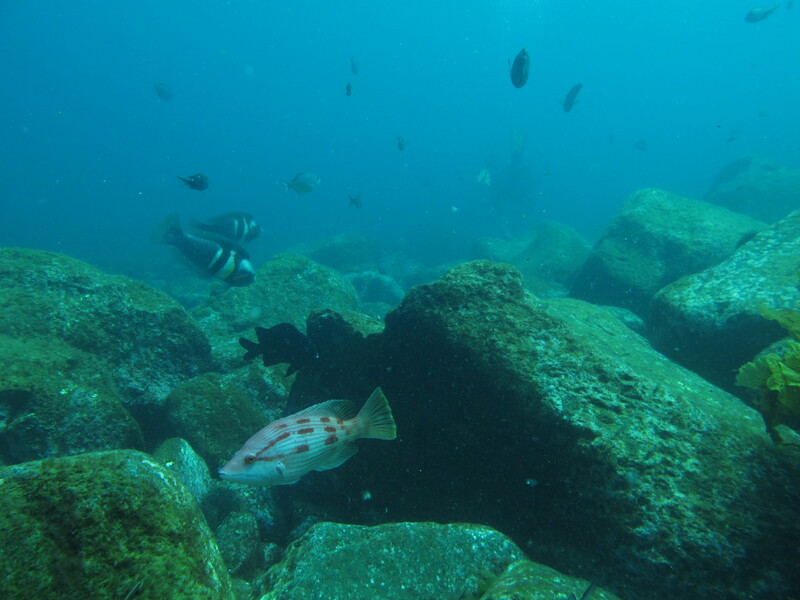 They exposed breeding pairs of cinnamon anemonefish to different levels of ocean acidification (OA) for two months before the breeding season. The astonishing thing is that their offspring weren’t negatively affected by this OA, whereas other juvenile fish coming from “normal” seawater were. What does this mean? That there was some sort of non-genetic adaptation within one generation! We don’t know the underlying physiological mechanisms for this adaptation, or what other long-term trade-offs it may have (e.g. reduced reproductive output in the offspring? ), but it is a promising outcome. Now all we need are more long-term, multi-generational research and we may begin to put a picture together on how our oceans will (or won’t) adapt to ocean acidification! Unlike some of the media coverage, I’m not saying that coral reefs will be resistant to ocean acidification, and I’m certainly not saying that corals will be. 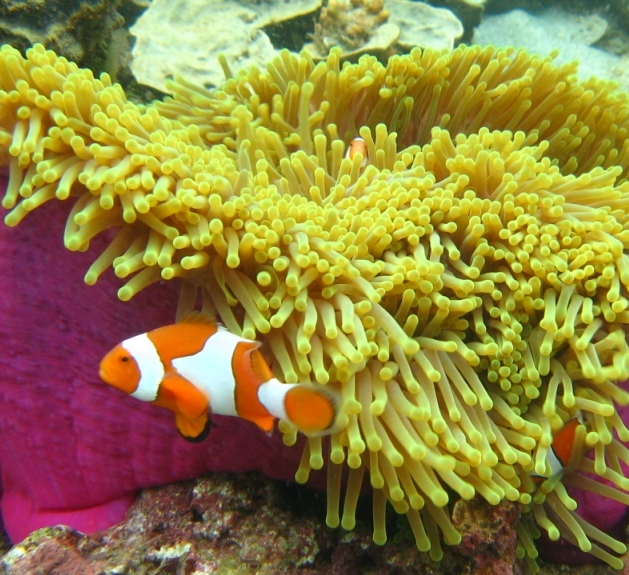 There is some good news for the gloom of ocean acidification. Yet, the devil is in the detail! Unknown to most people, Crustose Coralline Algae (known in the field as CCA to stop us tripping over the long name) are the pink algae which cement together the matrix of coral reefs the world over, effectively solidifying the structure that we know as “coral” reefs. These CCAs also form a dense, concrete like ridge on the exposed side of most reefs, protecting the more fragile corals from destructive wave energy. 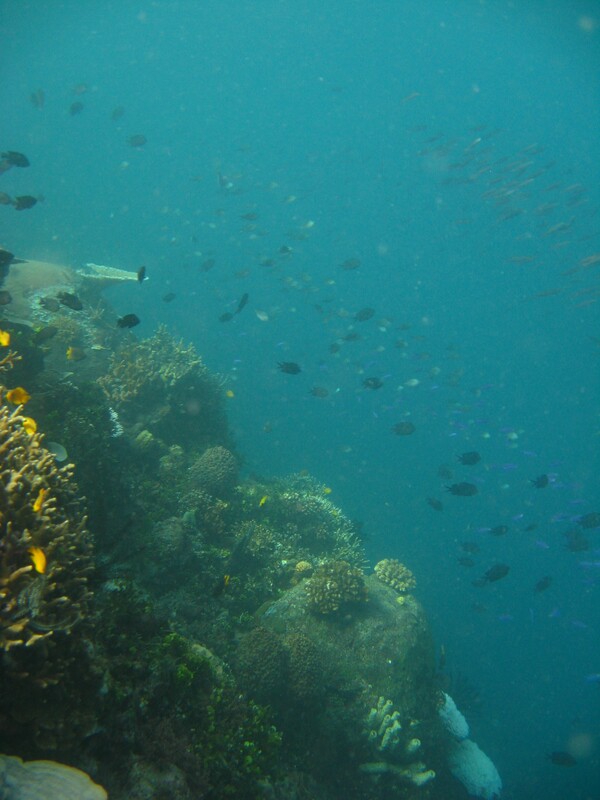 So, from a reef perspective they are very important. Until now, most of the research into the future of CCAs under ocean acidification has demonstrated that they are likely to dissolve (e.g. Tropical species and temperate species). However, some colleagues and I have recently discovered two important things about these CCAs, (1) that they contain dolomite, a rather robust mineral that most people associate with mountains in Italy; and (2) that dolomite is quite resistant to pH which we are expecting in the world’s oceans in the next 100 years (link to the paper here). What does this mean? Unfortunately it doesn’t mean that the world’s coral reefs are going to be saved from ocean acidification by dolomite-rich CCA. By all accounts the corals are still in trouble (though I still have my hopes for more adaptive capacity than we give them credit for!). However, there is some hope, because these CCA are likely to maintain their structure and thus continue to protect reefs from damage by waves.